Most drivers are concerned about other distracted drivers who may be texting on their phones, but it turns out most of them are guilty of the same thing. The top two concerns of people when driving are distracted drivers on the road (70%) and drunk drivers (45%), according to a new study. However, the majority (58%) of drivers say they check their mobile device while driving. The study comprised an online survey of 1,800 U.S. adult drivers conducted by Wakefield Research for Root Insurance. Another study from earlier this month found that the number of drivers distracted by smartphones increased over the last year, as I wrote about here at the time (Heavy Phone Users Found More Dangerous Than Drunk Drivers). That study, by Zendrive, found that the majority (85%) of drivers acknowledge that distracted driving is a problem but nearly half (47%) say they use their phones 10% or more of their time while driving. The Wakefield Research study found that the majority (52%) of drivers who check their mobile device while driving would most likely turn their attention away from the road and to their mobile device for a group chat, such as a text or email chain with multiple people. Phone use in cars seems relatively high, with 59% saying they have talked on the phone while driving, 51% have used maps or navigation and 39% have texted. Of drivers who check their mobile device while driving, 63% are most distracted by text messages and 33% by GPS, such as Google Maps or Waze. The average amount of time these drivers spend looking at their phone while driving is 13 minutes. Drivers also seem aware that using their phone while driving could get them into trouble, as 83% usually put down their phone when they see law enforcement. An interesting tidbit in the study is that 90% of drivers consider themselves better drivers that those who drive for Uber or Lyft. Of parents, more than a third (38%) have had their child ask them to stop using their phone while driving. Add another debacle to the long list of Facebook's privacy snafus: The company reportedly obtained and uploaded email contacts of 1.5 million users -- without asking them first. The company says it used the information to improve ads and suggest friends. News of the uploads was first reported Wednesday by Business Insider. Facebook adds that it previously told people how it would use their email contacts, but removed that language after redesigning a sign-up procedure in May of 2016. Intentional or not, the news shows that for Facebook -- already facing the prospect of billions in fines from the Federal Trade Commission over privacy violations -- privacy remains an afterthought, at best. The news is especially striking given that Facebook itself was previously involved in litigation over address-book uploads. Back in 2012, security researchers accused a host of developers -- including mobile network Path (subsequently acquired by Kong Technologies), Foodspotting, Foursquare Labs, Gowalla (acquired by Facebook in 2011), Instagram (acquired by Facebook in 2012), Kik Interactive, Twitter and Yelp -- of uploading and storing users' address books. Most of those developers reportedly asked people for permission to access their address books, but didn't say they would keep the data in their servers. A class-action lawsuit against the developers resulted in a $5 million settlement agreement in 2017. Tech giants google and Amazon have resolved a longstanding disagreement over streaming video. The companies say in the coming months, Google will bring official YouTube and YouTube TV apps to Amazon Fire TV devices, while Amazon will bring Prime Video to Google Chromecast devices. The addition of the apps marks the end of a streaming video feud of sorts. Four years ago, Amazon removed Google’s streaming box Chromecast from its store, citing its own video service wasn’t available on the device. Two years later, Amazon released a new device with a video screen, the Echo Show, which included access to YouTube. Google proceed to block access to its popular video platform on the device. Late last year, there were signs of a thaw between the two companies, as the Chromecast returned to Amazon's store. With today’s news, it appears the feud is over. YouTube is the most popular video platform on the planet, with the company saying it has nearly 2 billion logged in users each month. While YouTube is primarily viewed on computers and mobile devices, it has made pursuing the TV glass a top priority. Amazon’s Fire TV devices were seen as being less competitive than others because it lacked those apps. Separately, Amazon has turned Prime Video into a legitimate premium competitor to services such as Netflix and Hulu, seeking wider distribution. 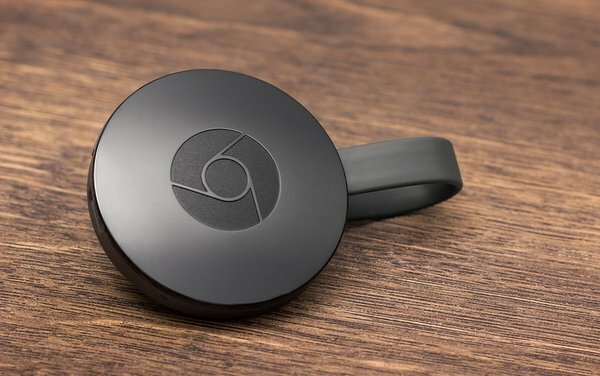 Google’s Chromecast devices would be a necessary part of securing the widest possible availability. A new form of malvertising only impacts ads served via programmatic exchanges, and 87% of those attacks appeared in header bidding in the past few months, according to an ad security provider. GeoEdge’s security team uncovered the malvertising that affects WebRTC, a commonly used server-less communications protocol, based on internal data monitoring tens of billions of impressions. The team reverse-engineered several scripts and deobfuscate the code used by the attackers. The company estimates the loss for publishers this year at $325 million. About 84% of the attacks occur on mobile devices and 16% on tablet. The protocol, which is backed by Google, Mozilla, Opera and Microsoft, attempts to solve the complexities of managing browser-based real-time communication. But WebRTC malvertising attacks are complicated. They only can be identified through behavioral analysis because the communications protocol doesn’t run on a server, so there’s no domain to block. Blocking domains is the most common way to stop malicious ads, according to the GeoEdge report. The malvertising attack is launched through cloud services from companies like Amazon AWS or Microsoft Azure. That challenge becomes blocking the cloud service will block all of the ads originating from it, even though 99% of the ads are safe. Amnon Siev, GeoEdge’s CEO, believes that WebRTC Malvertising highlights the industry’s need to add another layer of security and move beyond merely blocking offending domains. Brands need to rely on behavioral analysis technology that can uncover difficult to track malicious activities. Fraud remains the scourge of the mobile app marketplace. In fact, mobile app sophisticated invalid traffic” (SIVT) impressions have doubled year-on-year since 2017, according to DoubleVerify. “With ad spend increasingly concentrated in mobile -- and particularly mobile app -- fraudsters are redoubling their efforts to take advantage,” Roy Rosenfeld, head of DoubleVerify’s Fraud Lab, notes in the new report. “It’s critical that brands understand these risks, in order to allocate spend accordingly and install appropriate safeguards for their digital investments,” Rosenfeld added. Brands are spending loads of money on mobile channels. At $87 billion, mobile ad spend will account for more than two-thirds of overall domestic ad spend this year, according to eMarketer. This growth has been driven by large investments in mobile app advertising, which is expected to reach $201 billion in spend globally by 2021. As to whether in-app advertising is more susceptible to fraud than other forms of mobile marketing, the jury remains out. Recent research from Protected Media found that in-app advertising is actually subject to far fewer fraudulent attempts than mobile Web advertising. Still, many ad buyers believe in-app advertising and fraud go hand in hand. Indeed, Forrester Consulting recently found that brand advertisers cited fraud as their No. 1 concern. From mobile OBGYN care to personalized vitamins, the direct-to-consumer model has taken off in pharmaceutical healthcare retail. In fact, the global ePharmacy market is expected to reach $109.2 billion by 2025, growing at a CAGR of 14.8%. Technology is elevating the healthcare retail experience, and it’s only set to grow. Thanks in part to successful marketing campaigns aimed at destigmatizing certain areas of healthcare, brands like hims and hers have successfully pioneered the telemedicine industry, while digital pharmacies like Capsule have taken off in New York City. PSFK: What are some of the broader trends you see impacting healthcare retail today, and that you’re leveraging in your work? Sid Viswanathan: The pharmacy industry is a really large category. It’s about a 350 to 400‑billion dollar category. In many ways, a lot of what’s being done in pharmacy hasn’t changed for several decades. It’s the same retail pharmacies that we’ve all become familiar with. It’s the same insurance players that have really dominated the market. In the last three years or so since we came onto the scene, there’s been a massive shift in healthcare where patients can go online, consult with a physician around a range of clinical and therapeutic topics and receive a prescription for a specific condition. The missing piece in all this has always been how to get the medications to the patients. How can we do it reliably and in a scaleable way across all 50 states in the country? Similar to companies like Nurx in the birth control space or Hims in the hair loss space, we are the pharmacy partner behind the scenes that’s actually bringing the medication to the patients’ doors. 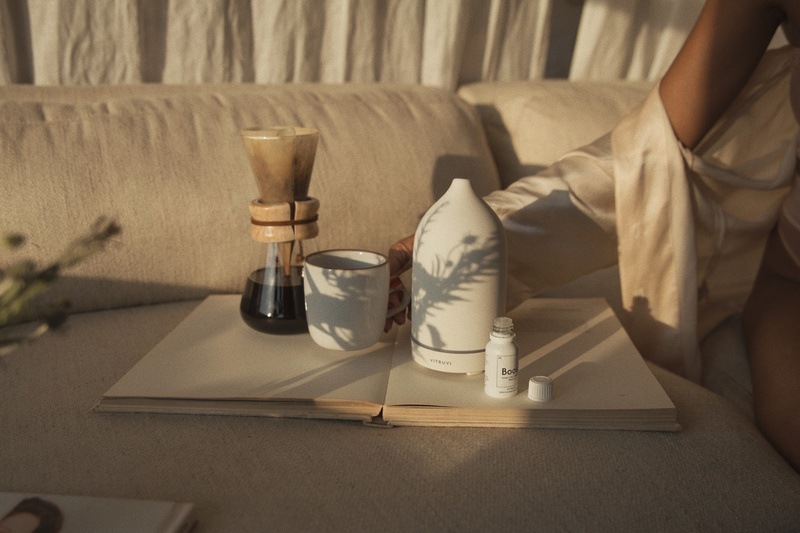 What we’ve seen in the last few years is a huge emergence of a number of other brands, like Hims and Roman, that are actually getting the product sent out. We’ve done this, too, at scale through a combination of our APIs, our software dashboards and our fulfillment centers. PSFK: Why did you decide to focus on pharmacy healthcare? What gaps did you notice in the industry, and how did that lead you to found Truepill? Umar Afridi: My background is in pharmacy. I was a retail pharmacist for 10 years before starting this company. During my time working as a retail pharmacist, I was basically taking note of all the manual processes that we do in pharmacy that result in the terrible experience our patients have. From the outside, customers see lines in the pharmacy. Behind the scenes, there are things happening causing these kinds of problems. For example, as a pharmacist, if I have a question about a prescription, the way that I would contact the doctor is print the prescription off, scribble a note on it and then fax it to the doctor. It’s like this black hole. We never know if we’re ever going to get a response, or when. The patient, however, will turn up expecting the prescription to be ready. No one can find it, because we haven’t received a response on it. There’s like a $600 copay or something. Then the customer is stuck. They have to wait another day for the doctor to reply. All of these types of elements created a really bad experience for both patients and everyone else working in that environment. With delivery, it’s more convenient. You can even consolidate all of the volume and have low cost. You can increase access to medication to areas where certain ones might not be available. You don’t need 10 retail pharmacies within a square mile. You might need one or two and can move everything else over to home delivery. This is essentially the direction that things are going to move in. By building the infrastructure as well as the technology, we’re positioning ourselves to be the entity that powers that transition. We started talking to founders in the space who were producing these kind of direct‑to‑consumer physician experiences where patients can go through this magical experience of having a consultation with the physician and having a prescription written at the end of it. The idea formed that if there was a super‑efficient fulfillment center connected via API to these existing direct‑to‑consumer companies, we could make it one seamless service. From start to finish, patients would just have this super convenient, easy‑to‑use system. In 2016, we set out to open the pharmacy. We went through the whole regulatory compliance process to set up our fulfillment center. We continued to talk to customers, figuring out more pain points around the software to solve those issues. We have a facility in New York that should be live in the next few months. We just got our pharmacy license approval for our facility in Manchester in the U.K. We are expanding our capacity internationally as well as combining that with automation, with the aim to be able to fill 100,000 prescriptions a day in the U.S.
PSFK: Truepill is a business‑to‑business company. Who is the Truepill consumer? Who is reaching out, and what is the process for when they do? If you went online and shopped at Nurx for a product and received medication at your door in the following days, the existence of Truepill is actually obfuscated from the whole experience. We quietly operate behind the scenes to get all of the infrastructure, the heavy lifting of securing the medication, the supply chain for the medication, the delivery, the packaging. It comes to consumers in a neatly packaged design in a box that represents the brand. Really, we are the white label pharmacy that operates behind the scenes. If you asked a consumer or the end patient, they might not even know who Truepill is. And that’s fine, because we’re here to power these existing businesses who are trying to build their own brands. This is the key piece that differentiates us from every other pharmacy on the market. We’re allowed to stay very clear in our value prop that we’re not doing anything direct‑to‑consumer. We’re not like a retail pharmacy that’s trying to get in front of customers and build our brand presence. We’re not like some of the other newer direct‑to‑consumer pharmacies that are also trying to build a brand presence. We actually are happy and excited to be in our world where we think it’s a much larger opportunity to power these existing brands with large patient populations. We’re only just scratching the surface with some of the initial customers that we’re working with. PSFK: Truepill uses a technology-first approach, an important strategy in the digital age. Could you speak to how this serves current consumer expectations? Sid: I think about what we experience every single day in our ecommerce lives in terms of our experience shopping on Amazon, dealing with subscribing, saving and Prime. Those ideas haven’t been translated over to the experience in the pharmacy world. If you are a mail order customer of an existing insurance network, we can point to a number of examples online where you would go to their website, you would download a form, you would fill out that form and you would fax it back to get onboarded into the mail order program. That gap is where we see the biggest opportunity of growth for our business. Coming from a software angle, we know how to build this experience. We have already built them, and we know how to translate this to a legacy industry. To us its a huge miss when customers are dealing with chronic-illness and life‑saving medications. The experience is just so poor. We think that a technology-first approach is what will solve that. PSFK: Looking to the future, where do you see Truepill in 3-5 years? Umar: Right now, we’ve been focused on the direct‑to‑consumer customers. We’re talking to drug manufacturers about powering their DTC, helping them get more distribution when they come out with new medications. We’re talking to smaller PBMs, the Pharmacy Benefit Managers, powering their mail order so that they can compete against some of these other big PBMs. It’s clear that they want to assume mail order, but they’ve never come across a service that their patients actually want to use. It’s always a terrible experience, and they never get anyone using it. It’s a clear benefit that if we come in, we can fill that gap and provide an amazing ecommerce‑like experience for their patients. It’ll cost their employers and sponsors a lot less money versus having patients pick up at retail. It’s also massively more convenient. You’ll see massive improvements in adherence when the patients are getting their medications every month delivered directly to them. Across the whole ecosystem, it’s basically lacking in technology. We are approaching all of these problems in a technology first way, combining all of that with automation to make it a lot more efficient, and figuring out ways so that we can add more value. Umar Afridi, co-founder and CEO, and Sid Viswanathan, co-founder and president. Truepill is improving the pharmacy experience by making ecommerce possible for telehealth brands. For more from similar inspiring services, see PSFK’s reports and newsletters. 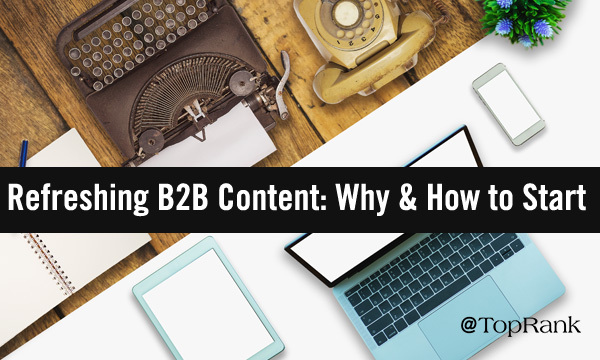 Content creation—it’s the linchpin of our B2B content marketing strategies. And 56% of B2B content marketers have upped their investment in content creation over the past year—more than any other spending area. Without a steady cadence of fresh, quality content we can’t proactively adapt to our audience’s changing needs nor consistently reach, inform, engage, entertain, or inspire action within them. And for most content marketers, this effort is often grounded in creating net-new content. 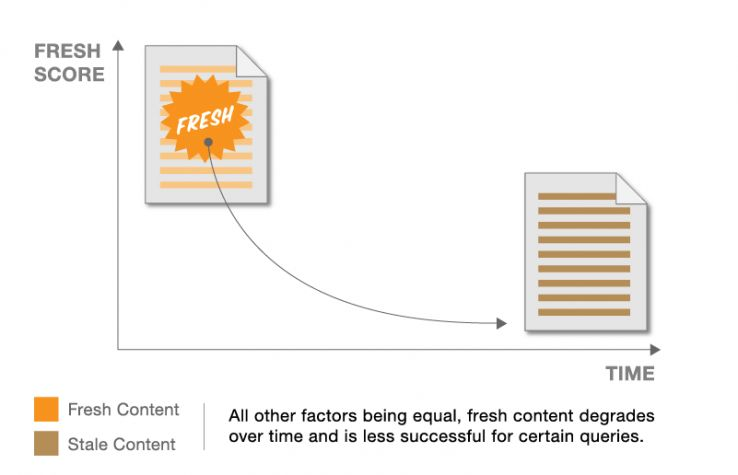 But freshness is the eye of the beholder; quality content creation doesn’t have to be done from scratch. Refreshing existing content is a massive opportunity, playing an integral role within your always-on content marketing strategy. It’s not only more efficient to produce, but when done strategically, it can also boost results, improve user experience, and extend the life and relevance of the content you’ve worked so hard to produce. As it’s been sung, everything old can be new again. Below are all of the reasons why you need to identify refresh opportunities and how you should approach it. #1 - Content takes time to “mature in search”—and needs to be nurtured. #2 - Refreshing allows your content to grow WITH your audience. As queries get more specific and question-based with natural language, making tweaks to your content to match those relevant queries and opportunities allows you to better match users needs. It paves the way for being the best answer, whenever, wherever, and however your audience is searching. Read: Hey Alexa: How Do I Bake Voice Search Into My B2B Marketing Strategy? #3 - Refreshing could give you leg-up on more than just your competitors. Content marketing is no longer the new shiny object in the B2B realm. Content marketing is simply modern marketing. As content continues to proliferate you’re likely competing for visibility and reach with your direct competitors within your industry, as well as indirect competitors such as third-party review sites, industry publications, independent bloggers, technology providers, and so on. 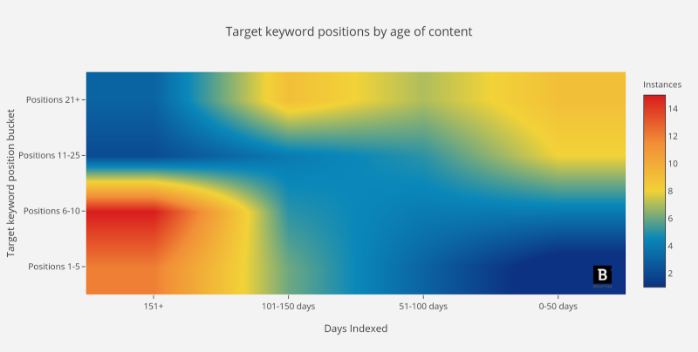 There are hundreds of billions of webpages in the Google Search Index, and while serving different audiences and thought leadership purposes, there’s likely some overlap in keyword targeting. Let’s take “B2B content marketing” as an example—industry publications such as Search Engine Journal, tools like BuzzSumo or HubSpot, platforms like LinkedIn*, and of course B2B marketing agencies like us, have all produced content on this topic. So, when it comes to refreshing content, you have the opportunity to see how your content is stacking up to all the competition and make data-informed tweaks to differentiate and personalize for your core audience. Refreshing is about both your audience and the search engine. So, when you revisit posts to make optimizations, you need to ensure you keep both parties in mind. Focusing solely on your audience could mean missing out on a critical SEO opportunity. And the opposite could be said when zeroing-in on SEO. To tick both boxes, carefully research your content’s current user experience with metrics like time on page, click through rate, bounce rate, pages per session, or scroll depth. Analyzing these data points should give you an indication of which areas of the experience need the most attention and which sections of your content may need adjustments. This helps you avoid delivering an unsatisfactory user experience that results in drop-offs from both your audience and site crawlers. Everything old can be new again. From SEO to growing your content to match your audience’s needs, there are several benefits that come from refreshing content. Refresh for success by conducting a content audit, keeping both humans and search engines in mind, and repurposing when and where it makes sense. via GIPHY How else can you maximize the value of your B2B content? Get an inside look into the future of B2B Content. *Disclosure: LinkedIn is a TopRank Marketing client. The post Everything Old Is New Again: Why & How to Refresh B2B Content appeared first on Online Marketing Blog - TopRank®. PSFK spoke to Virtruvi co-founder Sara Panton about how she uses knowledge gained from medical work around the world to inspire a new kind of wellness brand, and how she keeps in touch with a customer base as it grows. PSFK: Could you describe your background and how you came to found Vitruvi? Vitruvi is applying consumer interest in wellness to beauty, empowering consumers to take personal care into their own hands while also offering expert guidance. For more from similar innovative brands, see PSFK’s reports and newsletters. 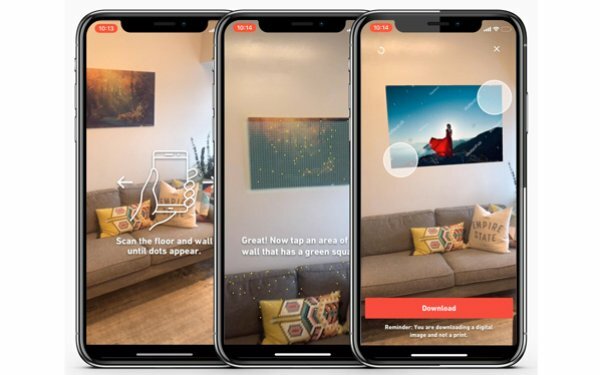 Shutterstock has introduced its first augmented reality feature with a “view in room” button for users to virtually position images on their walls. The app, based on the iOS ARKit framework, was created internally at Shutterstock, which houses 250 million images. With the iPhone mobile app, users can point their camera at a wall and virtually place an image there, while deciding whether to make a purchase. "This is yet another project developed from its initial iteration at our annual employee hackathon,” states Jon Oringer, founder and CEO of Shutterstock. “We decided to put this hack into production because of its potential to have an immediate customer impact." Google on Tuesday announced the support for Accelerated Mobile Pages (AMP) web results that displays publisher domain URLs when content is instantly loaded via Google Search. Google Search links to Signed Exchanges, a technical framework for the web that enables browsers like Google Chrome to display publisher URLs in cached AMP results. This happens when the publisher, browser, and the search engine context all support the connection. The feature is available today in Google Chrome, with plans to expand into the upcoming version of Microsoft Edge. Publishers will need to use the Signed Exchanges standard, which Cloudflare helped Google build. This technology, paired with Cloudflare’s global network of 175 data centers in more than 75 countries, allows the technology to assign each AMP page to Google’s AMP Cache -- giving the publisher’s page its own URL, not the one assigned by Google AMP. It lets publishers control their own cookies, analytics, and brand in the URL bar. Some of the benefits for publishers include the ability to direct AMP traffic to the publisher’s website domain. All visitors, AMP or otherwise, can coexist on the same domain. There is more space to display content on mobile screens. Website visitors may be more likely to stay on sites, reducing bounce rates, with publisher-branded domains. 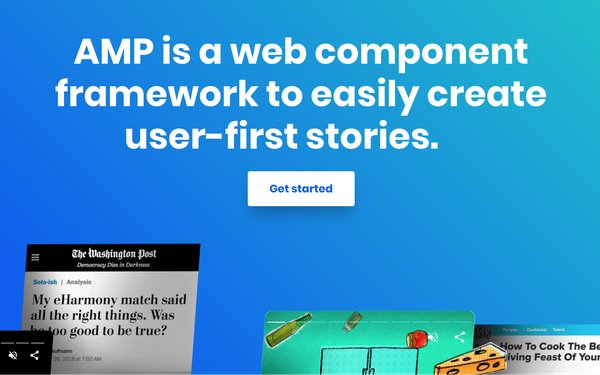 By relying on cryptographic techniques, AMP Real URL ensures that the content delivered to visitors has not been manipulated, protecting the sites and brands it is used on. Today, Cloudflare remains the only content delivery network (CDN) that works with AMP Signed Exchanges.